There’s so much to say about the Calibre Sentry. It’s quite probably one of the most important bikes we’ve ever reviewed at Wideopen. It’s a genuine, stone-cold game changer. But before we blow too much smoke up its arse, let’s start with the basics. The new Calibre Sentry is a big travel, big angles, big wheeled bruiser that’ll hammer pretty much everything except your bank account. 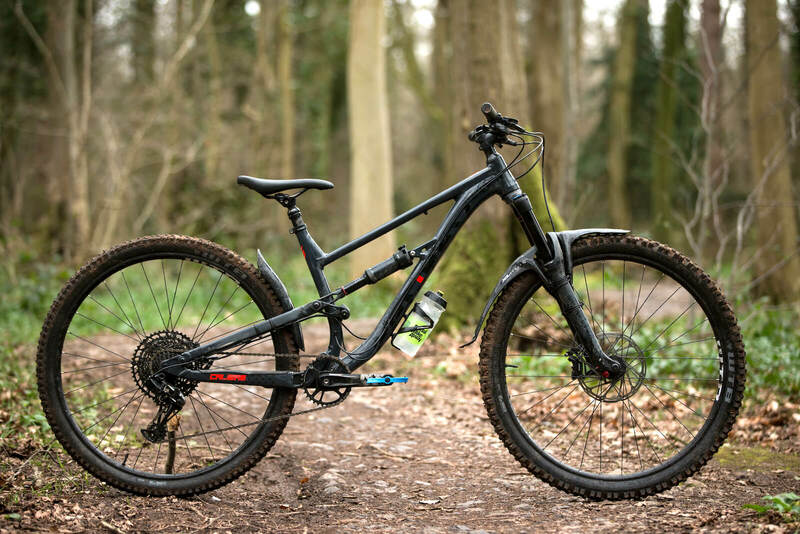 It has 150mm rear travel, 29″ wheels, long-low-and-slack geometry and it costs just £2000. There’s a slightly posher version, the Sentry Pro, for £2800 but we haven’t ridden that so we’re focusing on the base-model. The bike comes off the back of the success of the Calibre Bossnut and Ltd Edition Beastnut. Calibre designer Mike Sanderson has a knack for designing bikes that are rock solid and way below what you’re used to paying. That said, Calibre’s earlier bikes haven’t quite had the geometry or components to give the ‘proper’ mountain bikers much to worry about. That all changes, I reckon, with the Sentry. It’s one thing to make a bike for less than a grand that’s ‘fine’. How about making a bike for two grand with kit, components and geometry to really take on some ‘proper’ bikes? 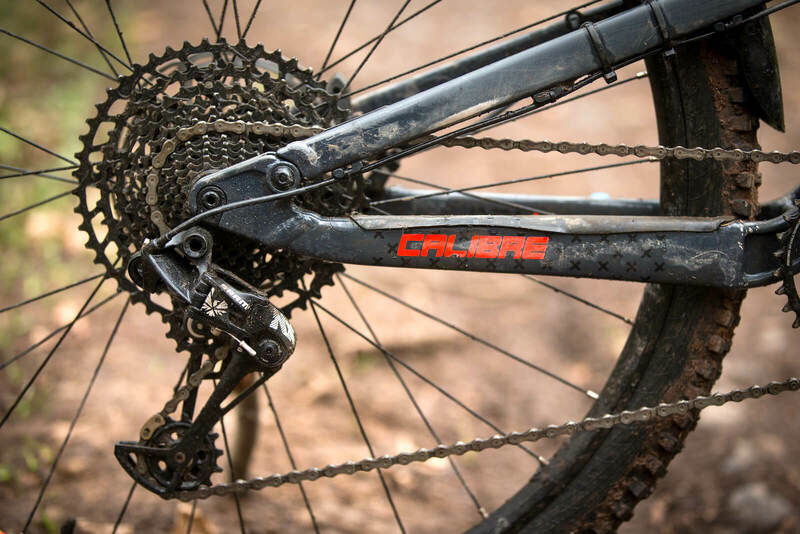 Calibre’s Mike makes no bones about taking inspiration from other bikes. In designing the Sentry he looked at what people were riding, what he enjoyed and where the flavour of the month was going. He aimed to replicate that in his new bike. Let’s look at the geometry. It has a slack 64° head angle. There’s a steep 76° seat angle. A 487mm reach on a large. 643mm effective top tube. 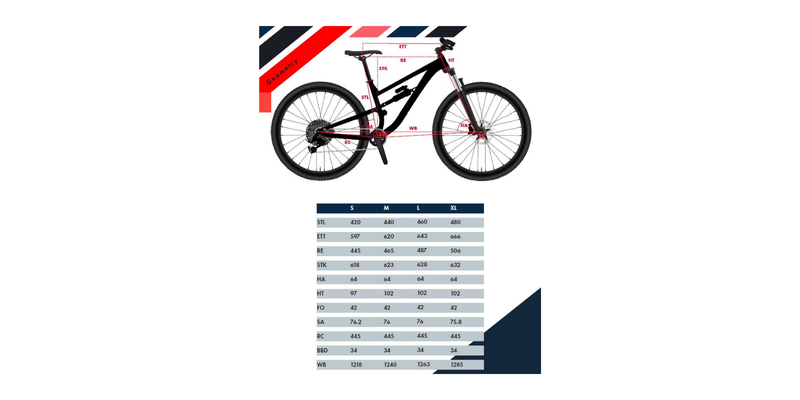 Those are some properly big, aggressive numbers that wouldn’t be out of place on bikes we’d chuck down an enduro national race or even an Enduro World Series. The fine details of the frame are a mixed bag with some obvious compromises to keep the price low. 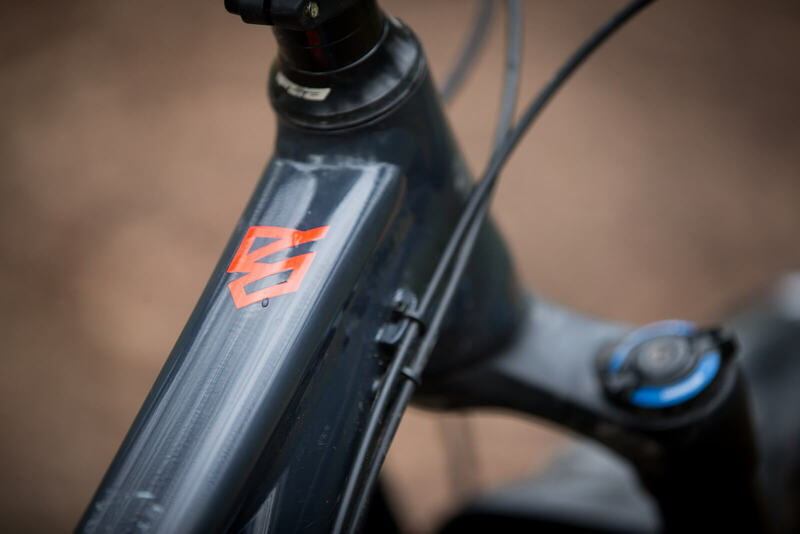 The frame has been built with a tapered head tube, 148mm x 12mm Boost rear axle spacing and a 30.6mm seat tube size. The BB is a no-hassle threaded setup that comes with a old-school looking, cheap-and-cheerful Powerspline BB. You can easily upgrade the BB to a posher version with external bearings if you like. The cable routing is the big cost-saver. Aside from a partially internal routing on the dropper, all the cables and hoses are external, held on with zip ties. 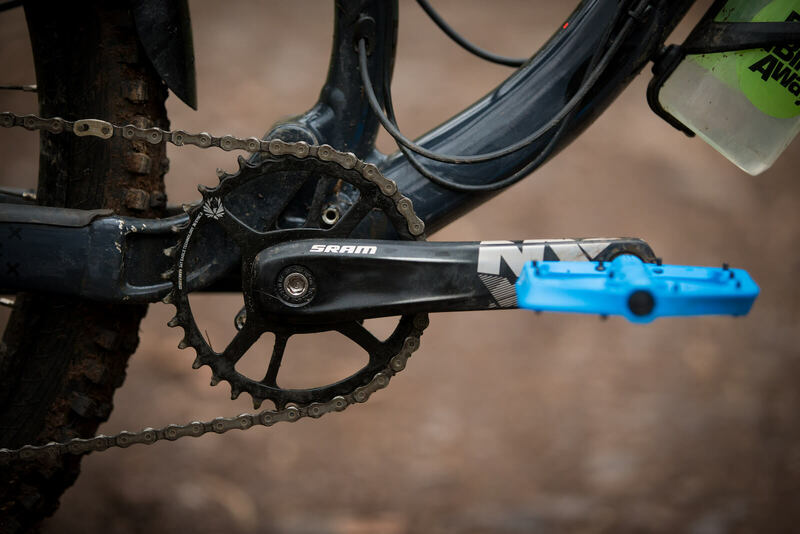 The approach does add a bit of clutter to the frame, most of all a big loop of cable near your chain ring. Mike told us “personally I don’t like internal routing and adding it to the frame costs a lot more money. To do it right we would have to spend a lot”. Fair. The suspension design is basic but effective and wouldn’t look out of place on a bike far pricier. Essentially, it’s a single pivot with a wee link to make the suspension progressive. That means that the bike gets firmer towards the end of the travel, giving it that ‘bottomless’ feel we all love. 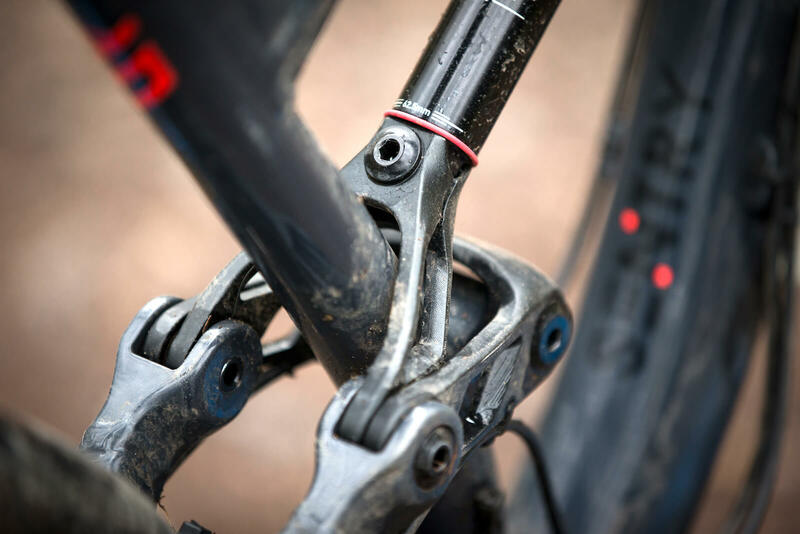 If you watch our video interview, you’ll hear Mike talk in detail about how they worked with RockShox on the tune of the suspension and the design of the actual frame. It’s good to know at this money you’re getting a fully researched setup that has been made hand in hand with the suspension manufacturer. And what about the kit? The Calibre Sentry comes with a pretty bloody respectable line up of bits. There’s a 160mm RockShox Yari RC fork with 42mm offset and an unglamorous but perfectly serviceable Rock Shox Deluxe R rear shock. The rear shock comes with rebound adjust but, that’s it. There’s no lock out, climb switch or other gubbins. The wheels aren’t particularly light but Calibre have put some decent work into speccing the best quality rims and tyres they think that they can for the money. 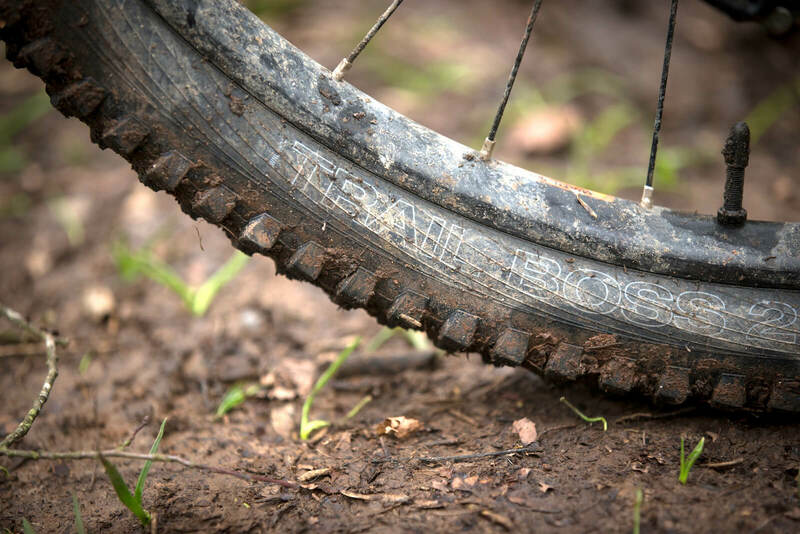 You’ve got WTB ST wheels with a WTB Tough High Grip 2.6″ tyre up front and a Trail Boss 2.4″ on the rear. They are, of course, ready to go tubeless out of the box. Brakes are also rock solid with the Guide RE’s on a combo of 180mm and 200mm rotors. They’ve been flawless so far. The rest of the kit is a mix of bits and bobs, with the majority coming from Kore, including a cable-pull seat post. I know you guys hate it but yep, there’s also a bottle mount on the down tube. 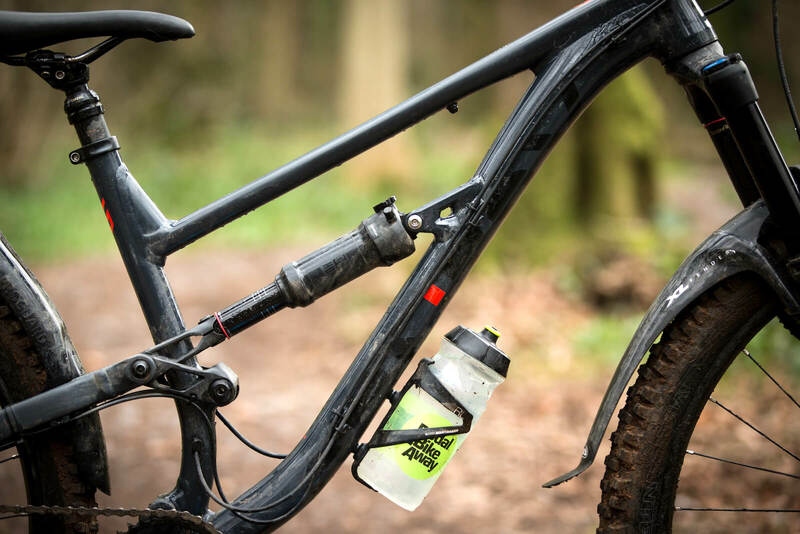 I regularly loose the bottle from this one when riding rough trails. Sorry nature. Good value or just cheap? It’s easy just to look at the price tag of the Calibre Sentry and assume it’s a winner. The proof is, of course, in the riding. £2000 is still a lot of money to spend, particularly if it rides like a dog. 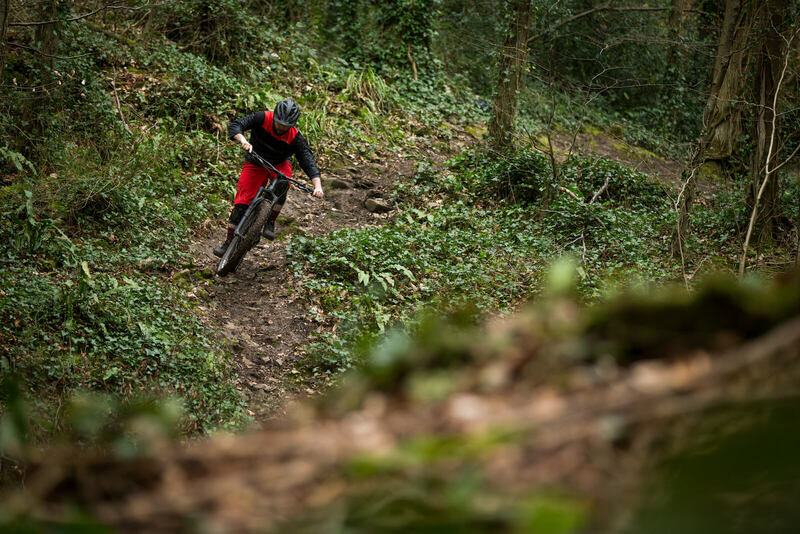 In the time I’ve had the Sentry, I’ve ridden it on some pretty demanding terrain including plenty of tight, steep and scary South Wales tech. I’ve hauled it up a fair few fire roads and battered it round off-piste, muddy, wintry laps at home and away. It arrived in January, it’s near April now. There’s a lot to love about the Sentry. 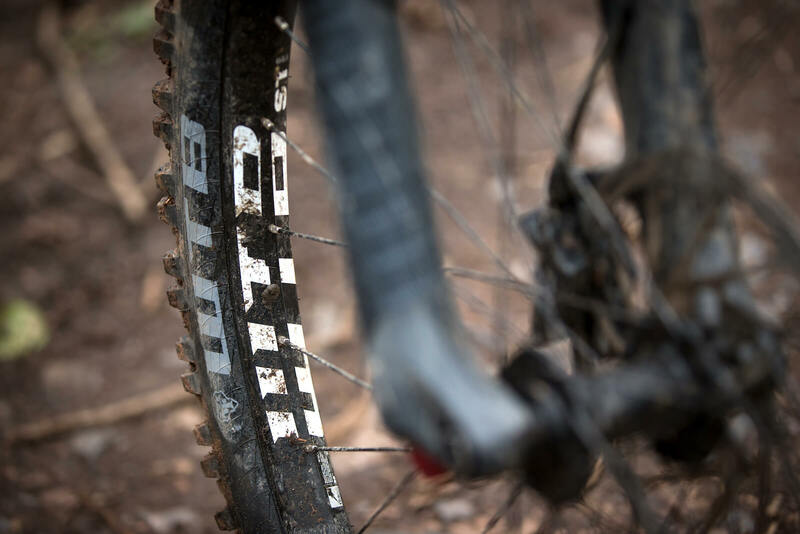 The size and slackness makes it a bruiser on rough and technical trails. 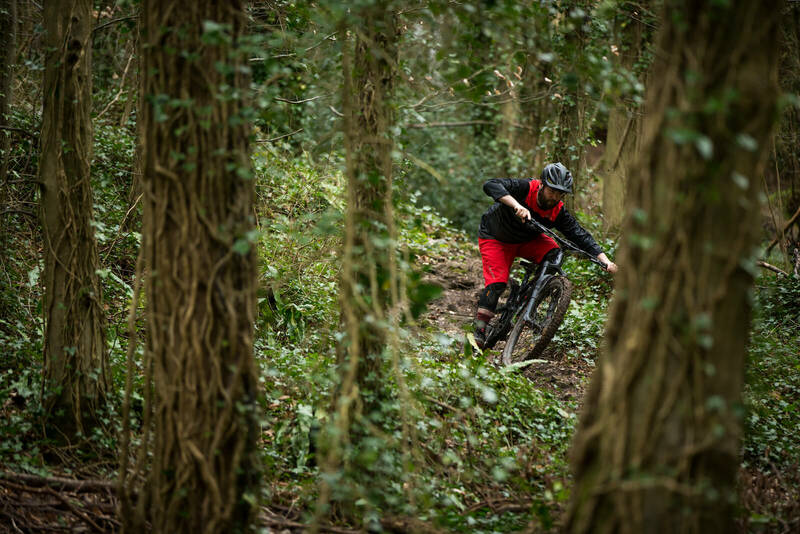 I’ve spent plenty of time battering it down new, steep, scary trails in South Wales and it feels safe, secure and fast. Mike named the bike ‘Sentry’ as a nod to what he’s trying to achieve with it. He wants a bike that has your back. A bike with geometry that’ll get you out of tricky situations and hold you on the path when you’re pushing on hard. Hence the name ‘Sentry’, meaning “a soldier stationed to keep guard or to control access to a place”. Down rough, rocky, steppy trails the length and the decently slack head angle feel good. You can plant yourself in the middle of the bike, let off the brakes and just let it roll. The size means any battering around doesn’t throw you wildly forward or backwards on the bike, which holds you nicely in shape. If you like going flat out, racing enduro or just long, technical runs I think you’ll like that a lot. My first ride on the bike was a sign of how good it is. I started slow due to the brakes needing bedded in. One trail later I was chasing Mike down unfamiliar singletrack as hard as I could, grinning like an idiot and having a blast. I wanted to go faster, buzz his back tyre and try stupid lines. The bike, despite being far below the spec of my usual ride, gave me loads of confidence to push it hard. My advice would be to demo the Sentry before you throw down money. Give it a good chucking down some technical, fast, rough trails if you can. Don’t forget a few climbs back up to see how it compares to your old bike. There’s a flip side to the geometry I think. I don’t think it will suit everyone. I think the big, long, low, slack thing does take away some of the playful nature of riding a bike. Ridden back to back with shorter bikes I think that’s quite pronounced. There’s more effort and speed require to flick the bike around, pop between lines and mess about. 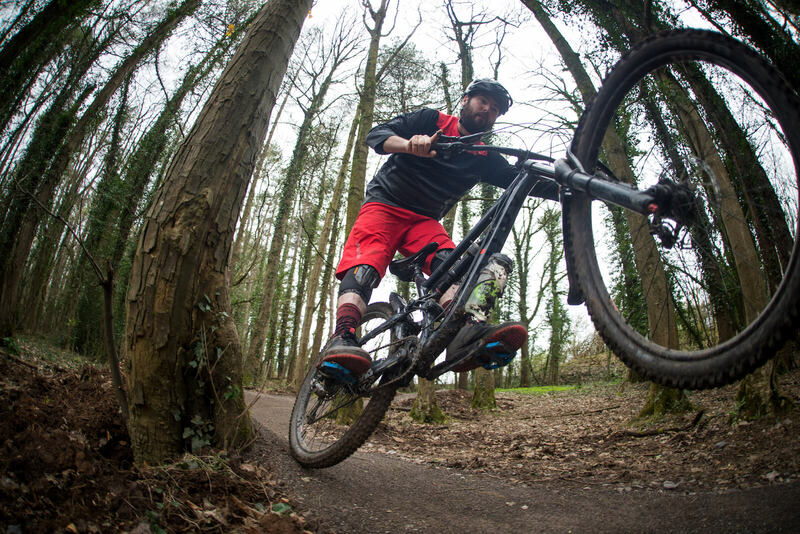 It’s a bike that’s fun at speed and in rough terrain but maybe less so on mellow, surfaced, trail centre trails. Maybe also less so when you’re getting up to speed, rather than when you’re at speed. Jumping back to more compact bikes with similar travel and similar head angles definitely felt a little more poppy, playful and fun. That’s something you’ll find when comparing bikes of any brand though, not a specific fault of the Sentry. 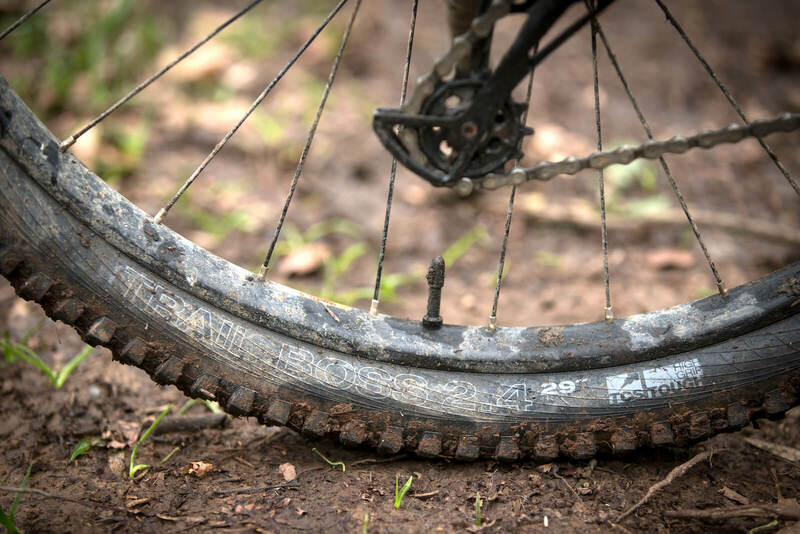 A less experienced rider might benefit from the security of the size and shape. They might also, I think, find it a bit of a beast to chuck around, get up to speed and enjoy as much as shorter, less slack bike. 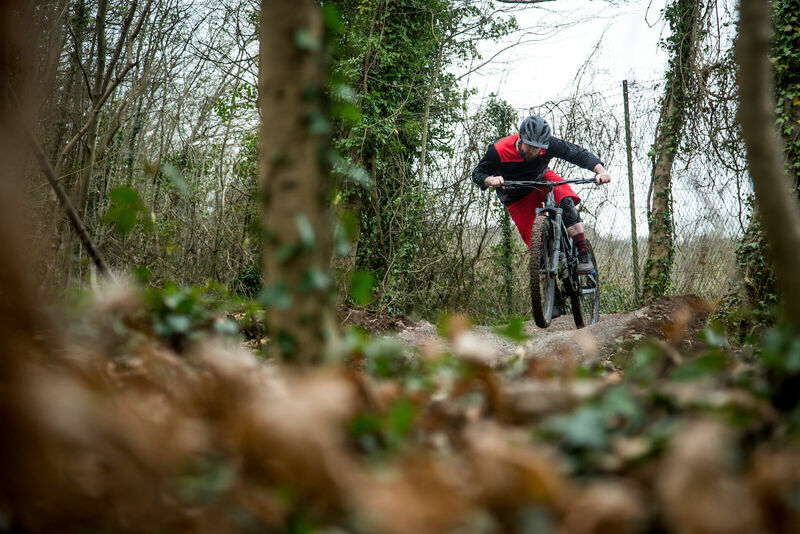 A rider that’s tight on budget but determined to ride technical trails will, most likely, absolutely love it. I’ve talked a lot about descending on the Sentry. It’s definitely a bike for winching up fireroads and hammering down downhill tracks. It’s not light in the least. It weighs around 36lbs and it has toughish tyres and loads of travel. 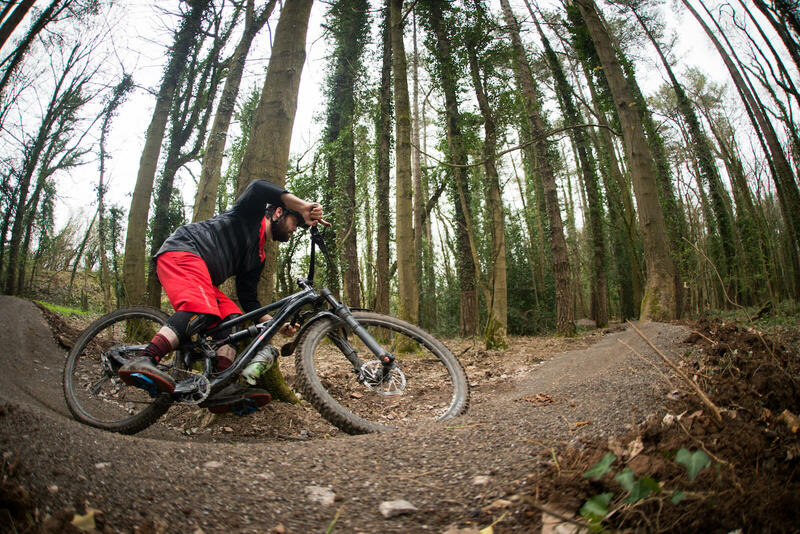 If you’re out riding fast, punchy, pedaly trails with loads of undulation this might not quite be the bike for you. That said, the NX Eagle cassette and long seat post makes it easy to pop the seat up and spin. Light and sprinty though, it is not! Are there any other ‘could be better’ points? There’s a couple. 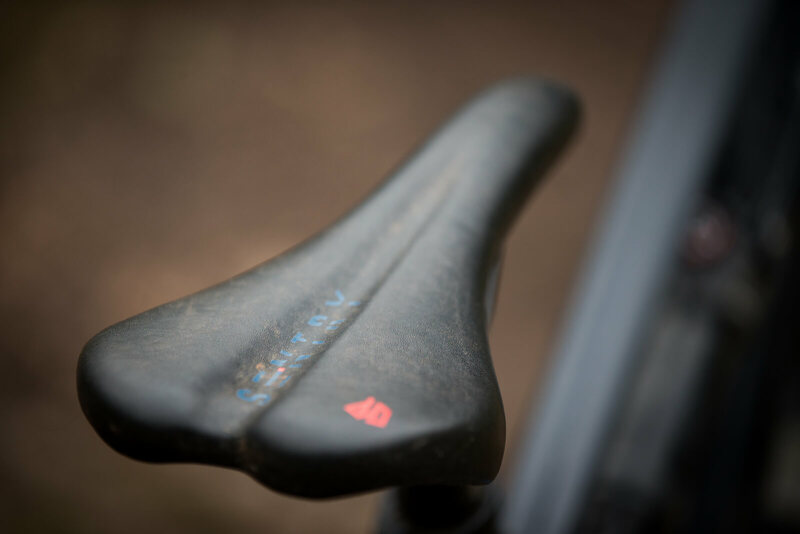 The Kore seat post was a pain in the arse and failed from day one. 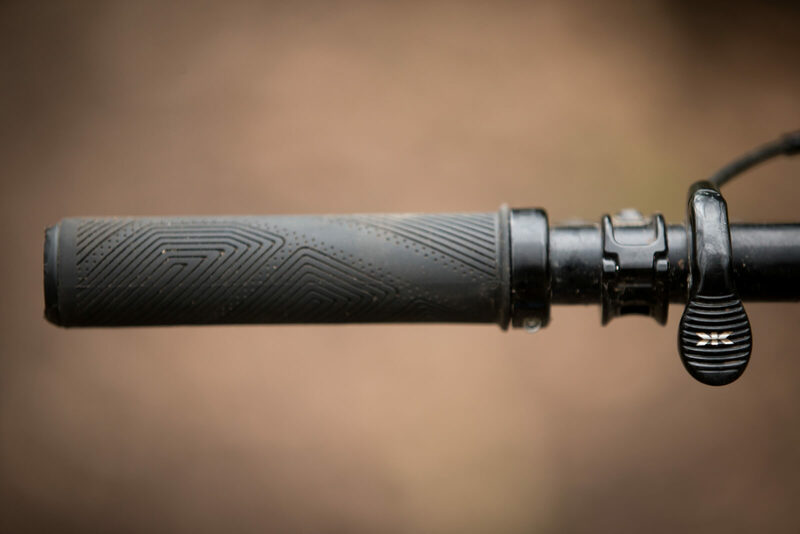 Calibre have shown us the evidence from the manufacturer that this will be fixed for production bikes. The bottle cage position is a pain but I can live with it. The paint isn’t the best I’ve ever seen and in the time I’ve had it, it’s taken a bit of a hammering. I’d get some frame-tape fitted from day one if I had my time on the Sentry again. So what do we think of the Calibre Sentry? OK, let’s be honest, the Calibre Sentry isn’t the only bike available at this price. There are plenty of other bikes with similar components for similar money. £2000 gets you a hell of a bike in 2019 and there’s a few decent options about. For me at least, the Sentry stands out because of the geometry and fine details. There are very few other bikes that have taken very progressive, very aggressive geometry numbers and put them on a bike of this price. 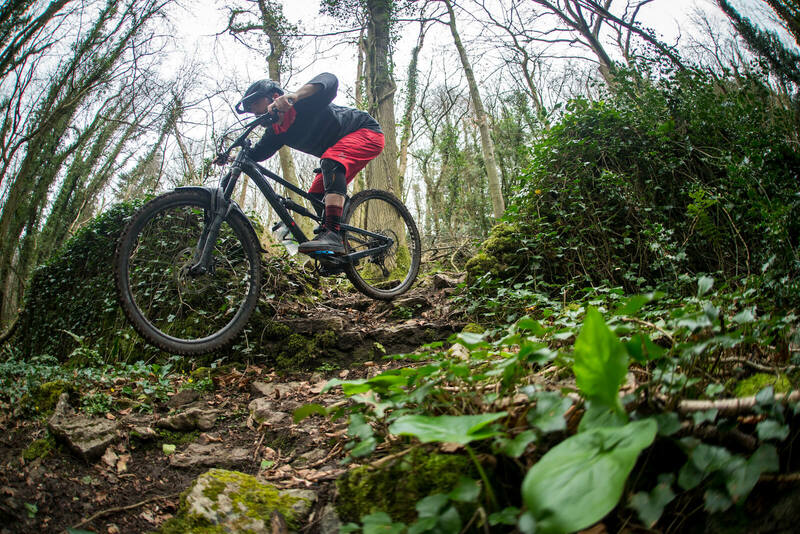 The Sentry is genuinely a bike that you could go race a British National Enduro, Mini Enduro, Scottish Enduro Series, Welsh Gravity Enduro or similar on and have an absolute blast. 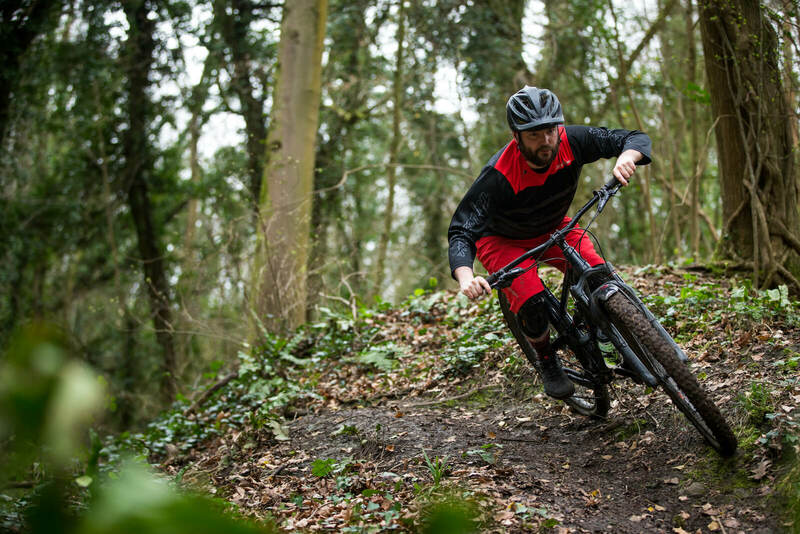 You may find it rougher going compared to the guy on a finely tuned, top-spec fork and shock but… I don’t think you’ll be minutes behind if you’ve got balls and a bit of talent. You could spend £2000 on the bike, buy a week’s holiday in the Alps and a season of race entries and still spend less than you might do on a supposed top end enduro bike. That, for me at least, is why the Calibre Sentry is one of the most important bikes we’ve ever featured on Wideopenmag. Don’t forget to check out the Calibre Sentry Pro if you like the bike and have a bit more cash. The Calibre Sentry and Sentry Pro will be available at GoOutdoor at the end of April. You can register your interest with GoOutdoor and they’ll let you know when they go live. Register your interest for a Sentry here and a Sentry Pro here. I currently ride a Beastnut ,and was so impressed I bought my son a Bossnut evo when he needed a new bike. You mention getting a test ride on the new bike, do you know where/how that is is available? Through go outdoors or Caliper? Comments for Dave:- Both my son (13) and I love the bikes, although he can’t ride at the moment, he broke his arm jumping!